A collection of poignant, relatable essays from the author of Never Have I Ever about coming out in her late twenties, entering into her first relationship, and figuring out what it means to be an adult. When Katie Heaney published her first book of essays, chronicling her singledom up to age twenty-five, she was still waiting to meet the right guy. Three years later, a lot changed. For one thing, she met the right girl. Here, for the first time, Katie opens up about realizing at the age of twenty-eight that she is gay. In these poignant, funny essays, she wrestles with her shifting sexuality and identity, and describes what it was like coming out to everyone she knows (and everyone she doesn't). As she revisits her past, looking for any "clues" that might have predicted this outcome, Katie reveals that life doesn't always move directly from point A to point B--no matter how much we would like it to. In a warm and relatable voice, Katie tackles everything from the trials of dating in New York City to the growing pains of her first relationship, from obsessing over Harry Styles (because, actually, he does look a bit like a lesbian) to learning to accept herself all over again. Exploring love and sexuality with her neurotic wit and endearing intimacy, Katie Heaney shares the message that it's never too late to find love-or yourself. 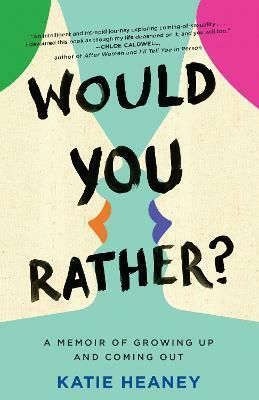 Praise for Would You Rather?